This week Ryan, Terry, and Justin sit down to discuss the upcoming release of P.G. 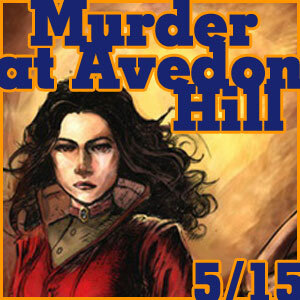 Holyfield’s novel “Murder at Avedon Hill” published through Dragon Moon Press. The Amazon rush is happening 05/15 at 12PM EST. Be there with us! PG will also be on Podioracket this Thursday (05/13) at 9PM EST. This link to Amazon is live, but please wait to make your purchase until Saturday, May 15th at noon eastern, to help get those sales numbers as high as we can with the Amazon Rush!